out of the cloud and onto your computer. 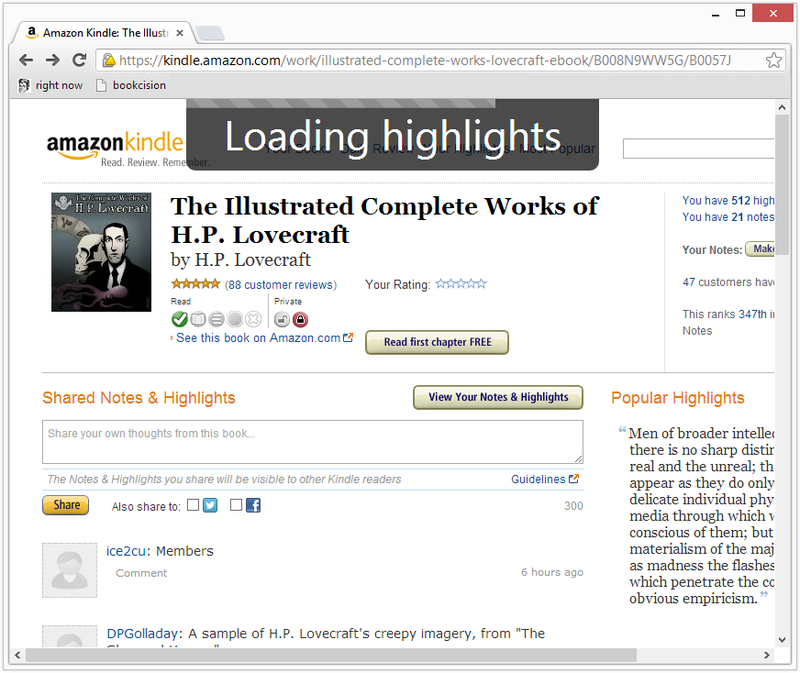 When you highlight or note a Kindle-purchased book on any Kindle device app, those annotations are automatically synced with Amazon's cloud. These are then visible at read.amazon.com, but there is no reason to believe that Amazon will continue to provide this service forever, and our ability to work with text in that hosted browser-based environment is limited. 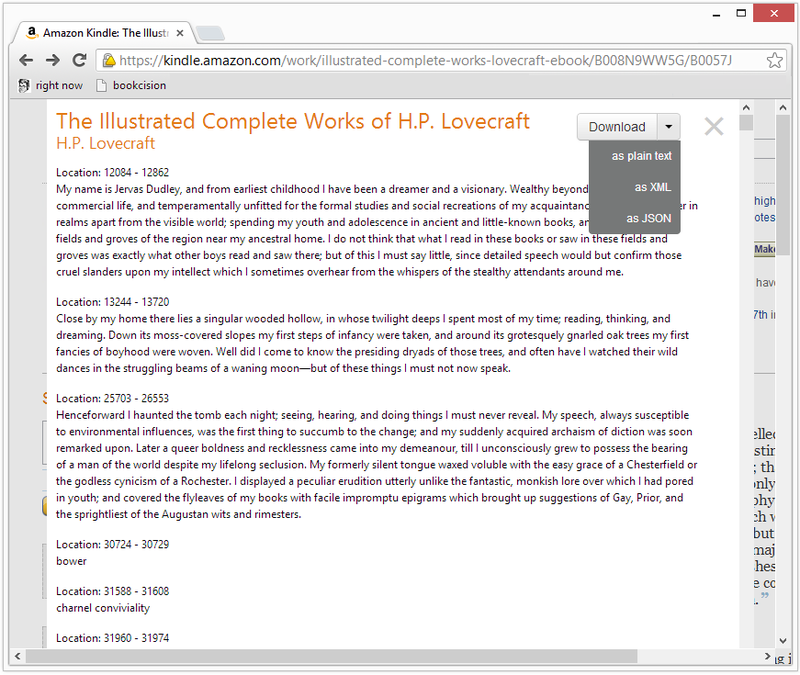 We wanted a way cleanly to download our highlights onto our local computers, so we created a bookmarklet that permits one to easily extract highlights from the book's read.amazon.com page. Chrome users will additionally be offered the ability to download the highlights in plain text, JSON, or XML formats. Having trouble with the bookmarklet? Bookcision is maintained by Readwise — please drop us a note, or create a Github Issue, with a detailed bug report and we'll try to help out. 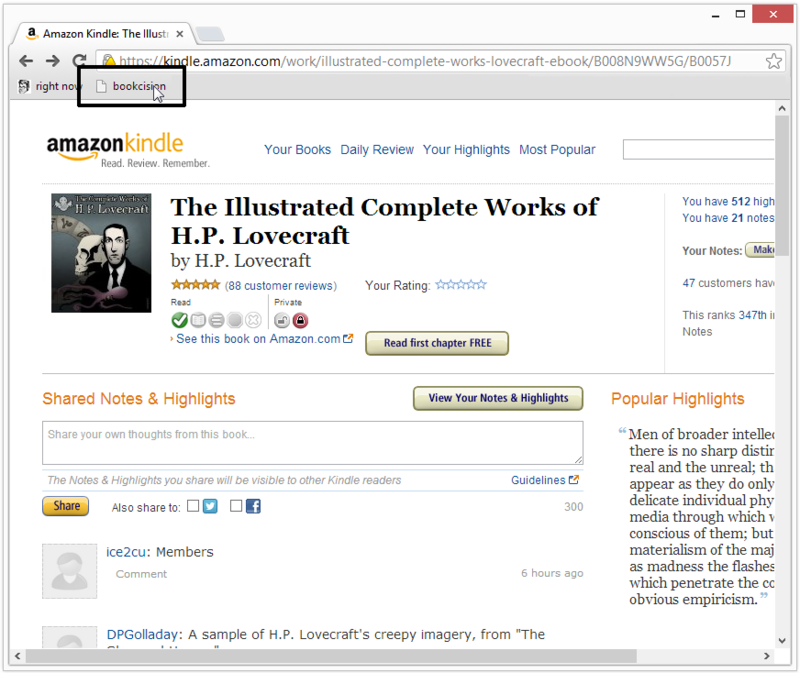 Drag the above button to your browser's bookmarks bar. 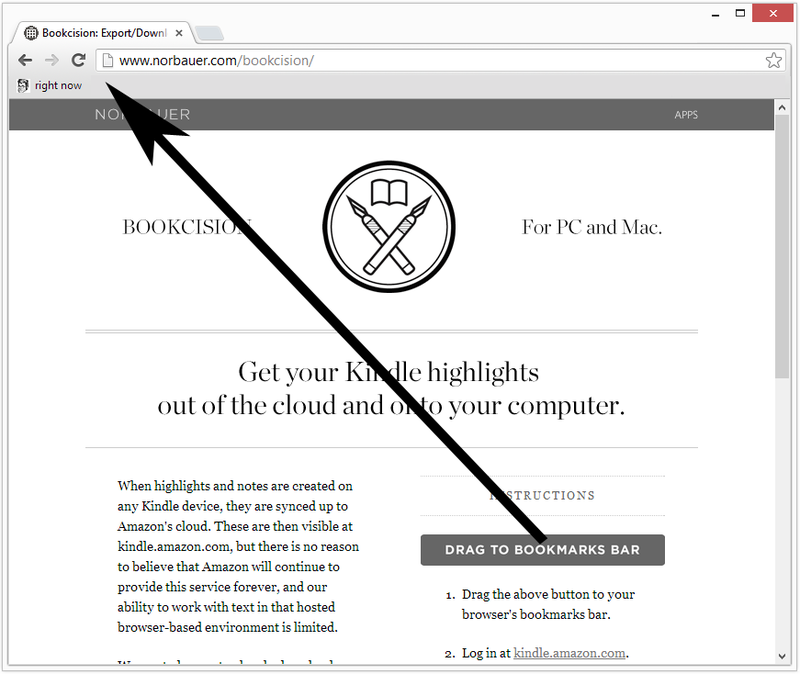 When the book's page has loaded, click on the "Bookcision" link in your browser's bookmarks bar. An overlay will load with just your highlights. If you are running Chrome, you'll see an option to download your highlights in various formats. Otherwise, just copy and paste the contents of your cleaned-up highlights to wherever you would like. 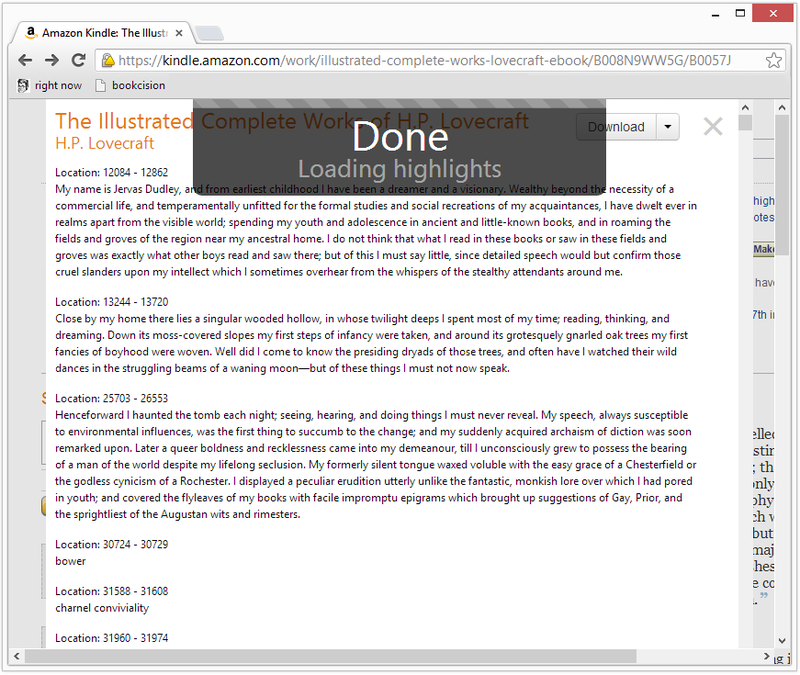 If you'd like a daily email resurfacing an assortment of your best Kindle highlights, check out https://readwise.io. To complete the hand-off, all you need to do is reinstall the bookmarklet and delete the old one. Everything else about Bookcision will continue to work exactly the same, and the project is still open source and free.